Can You Imagine a Life without PowerPoint? What would you do if you couldn’t take a ‘deck’ into your next sales appointment? In the nineties my team launched a product into the UK market and we each received one of those triangular presenters that open up into a little stand for you to flip your plastic covered photocopies over in front of the customer. I’d never had anything like it before – amusingly, back then, it was cutting edge – it also meant for the first time in my career I could just speak AT the customer rather than having a conversation about what they actually wanted – you know, cut out all that unnecessary selling stuff, go straight in with the opportunity and price. Trouble is, telling ain’t selling! Recently, with an extremely senior sales team, I mentioned that they were probably over reliant on their 120-slide brand presentations – which nearly got me carried out and burnt at the stake. But I reckon you probably know better. So ask yourself this – Do you simply go in and TELL customers what you’ve got; or do you FIND OUT what they want and then help them achieve it with what you’ve got? Subtle difference, enormously different results. Listen, I’m not going to take away your wonderful presentation, carefully created by marketeers who have never had to stand in front of customers and then be measured for their results – but just try this out for me. Think of 5 open questions you could ask before you give your presentation – 5 open questions that will lead to a conversation about their needs, gaps in the market, unexplored opportunities – which then give answers that require a presentation about your product or service. If you do – and you get it right – you don’t just talk AT them, you spend your time showing them why your presentation actually MATTERS while you’re going through it – you even know which bits are no longer relevant and – god forbid – can miss some out. Your Mission – by the time you’ve finished presenting they’ve recognised the value of your product or service because it was aligned with a set of needs and requirements that they’d pointed out at the beginning of the meeting. Your Mission – During the conversation about their needs and requirements they’ve already started to recognise the value of your product or service and don’t need to see the presentation at all. 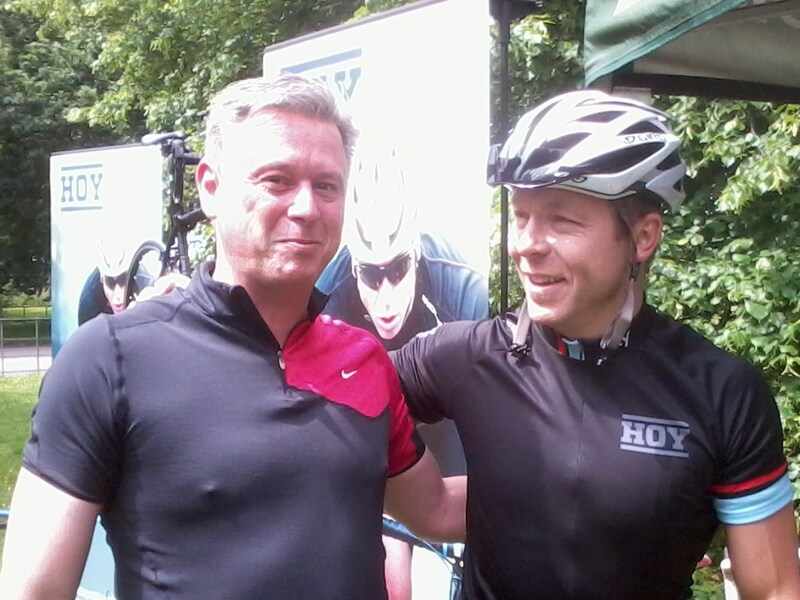 Last week I was invited to meet Sir Chris Hoy – the 11 time world champion and 6 time Olympic champion, the most successful Olympic cyclist and British Olympian of all time. A select group of us were invited to one of the launch dates for the new range of bikes which Sir Chris has developed exclusively for Evans Cycles. Anyway, no surprise to the regular reader that, as we made our way through the Cheshire countryside, I couldn’t help but spot a few similarities with a number of things that happen during a day’s sales training. Before we got on our bikes, the chap who was organising the day pointed out that in the presence of Sir Chris, only an idiot would attempt to show off. And what’s that got to do with Sales Training? Our Head of Training, Tom Morgan, regularly reminds delegates that training should be a time to learn new skills, try out new techniques in a safe and non- judgemental environment. But there’s always a percentage of sales people who can’t wait to tell everyone about their existing skill set – a bit like going for a Formula One driving lesson and desperately wanting to show the instructor how good you are at riding your bike. 2. How far is it from talented amateur to seasoned Olympian? Our route was fairly flat, but I’m told a similar event in Sheffield was far from an easy ride. Right at the beginning, from the very first daunting hill, there were a couple of riders who got off and decided to walk. Certain managers recognise where their team are and the training that they really need – others unfortunately don’t. We have a number of methods to help customers understand the ability levels and training requirements of their teams (click here to have a look at some examples), after all, ensuring people receive sales training that makes a real difference is the reason we do what we do. When sales people think they already know enough or are just too lazy to invest a little time at foundation level, you can end up with a group who suddenly realise they’re way out of their depth – not only because they can’t keep up – but because they were blissfully unaware the hill ahead of them even existed. Even though it was a commercial event – it was a secret. Numbers had been kept down because Sir Chris wanted to make sure he could spend quality time with everyone there, both during the ride and afterwards (with coffee and cake). If it had been advertised there would have been hundreds – great for the masses and possibly a few more bike sales, but less of an experience for those who had been chosen to attend. That’s a bold call for what was essentially a marketing day – hats off to whoever made the choice. A few members of the public stumbled across it by accident, Sir Chris graciously signed autographs and a couple of kids got a photograph and a special pack of goodies to remember their day. One lady was very put out that it hadn’t been made public – she didn’t think that was fair at all. Recently, one of our customers wanted to recognise their star performers by creating a platinum level within their existing sales academy. The idea was that we took the top 5% of the sales team and helped increase their current results by an extra 5% – can you imagine the effect that kind of growth has on business at that level? Massive! Of course some of those who weren’t chosen were furious. Interestingly it wasn’t the ones who just missed out, that group were determined to make the grade next time round, prove their worth and show the value they could deliver if the business gave them the chance to grow. Oh no, the sales people who felt slighted by their omission from the platinum group were way off the top 30% and had no intention of changing anything about themselves – as far as they were concerned they were already good enough to get in, it was just that the business couldn’t see it. The cyclists were then split into five groups based on ability and as I looked round I saw people who had turned up because they desperately wanted to be there, enjoying the opportunity, possibly learning something new, they fully understood others would have given their right arm to attend and so treated it like the privilege it was.